Senate Majority Leader is intent on moving the Immigration Bill up to next on the schedule to the chagrin of Republican’s and Democrats alike…. Democrats are afraid that any chance they have of keeping both Houses of Congress could down in flames…..
Republicans are happy feeling that if they hold tight against Immigration that they will be able to make dramatic gains in the South and MidWest along with states with high unemployment still….. The whole thing is gonna make the Current Wall Street Financial Bill’s passage look like picnic…. Everyone can thank the State of Arizona for helping to put the Bill in the spot light…..
Senate Majority Leader Harry Reid rejected a proposal from supporters of a stalled Senate energy bill that would move immigration reform through the regular committee process on a priority basis and allow the energy bill to move forward on the Senate floor. The proposal would tentatively set action on immigration for November, after the midterm elections — a delay that even some Democrats would welcome. The swift rejection of the potential compromise came a day after the energy reform package was sent to the Environmental Protection Agency for analysis — a sign that the measure’s co-sponsors, Sens. John Kerry (D-Mass. ), Joe Lieberman (I-Conn.) and Lindsey Graham (R-S.C.), have not given up on it. The proposed schedule was presented to Reid as a way of settling a dispute that erupted over the weekend on which measure should be taken up first in the Senate. Sen. Ben Nelson (D-Neb.) concurred. “Clearly, it’s time to get the borders secured. Then I think you can talk about immigration reform,” Nelson said. New Jersey Sen. Robert Menendez, chairman of the Democratic Senatorial Campaign Committee, downplayed the political impact an immigration debate would have on red state Democrats, including Sen. Blanche Lincoln of Arkansas. Graham and other Republicans have accused Democrats of trying to expedite the issue to galvanize Hispanic supporters who could tip the scales in races this fall — including Reid’s tightly contested reelection campaign in Nevada. But Menendez, who is just the third Hispanic to serve in the Senate, said Graham “overreacted” to Reid’s push to get the bill done this year. “With all due respect to Lindsey, I don’t think any single senator can dictate what the agenda of the Senate is,” he added. Still, he nodded to the complex politics of such a debate and urged the White House to have a bipartisan summit to determine whether any other Republicans would be open to a bill. Over the last few week’s the Dog has seen one name pop up in the most unlikely places…. With Democratic Senator Schumer……With the Gitmo and Immigration stories….. So Mr. Graham, a cherubic-looking 54-year-old, has been busy this year, reaching out to Democrats in an effort to broker deals on hot-button issues like energy andimmigration and closing the prison at Guantánamo Bay. As the rare member of his party who is consistently willing to cross the aisle, he has filled a niche once occupied by his close friend and mentor, Senator John McCain, the Arizona Republican. 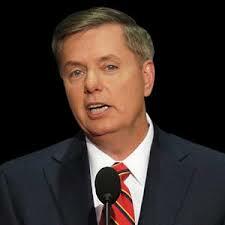 Now, though, Mr. Graham’s position as the go-to Republican for the Obama White House is in doubt. Over the weekend, he abruptly reversed course, backing out of plans to unveil a long-awaited bipartisan energy bill — a high priority for President Obama. He has scheduled a news conference for Tuesday to urge the Senate Democratic leadership to put off debate on another of his priorities, an immigration overhaul. Mr. Graham says he had received assurances from the Senate majority leader, Harry Reid, that energy would come first and accuses him of making a sudden push for immigration — an effort Mr. Graham says will only divide the country — to appease Hispanic voters in an election year. His reversal has thrown official Washington into a tizzy, raising questions about his motives. Some Democrats whisper that he must be trying to spare Mr. McCain, who is facing a tough primary challenge from the right, an uncomfortable vote on immigration. Others openly surmise that Mr. Graham must have caved in to his Republican critics. The White House and Senate are close to deal on the Gitmo detainees….doing military trials not civilian ones….. The deal is being done by the White House….. just as the Dog predicted it would be….. The Dog mentioned in a past before that Obama won’t make the rookie mistake of letting a cabinet member make a policy decision that will put him a jam anymore….this isn’t unexpected …..all president’s go thru this transformation…learning that in the confrontational world of national politics you cannot afford to let people make decisions just on their merits (imagine that! ) …..politics rears its head in everything…..
Here’s some of the piece from the Wall Street Journal……. The deal would put the alleged mastermind of the attacks of September 2001, Khalid Sheikh Mohammed, his fellow plotters and other top terror suspects before revamped military commissions, rather than in civilian trials as the Obama administration had sought. These courts would offer defendants more rights than they had under the Bush administration, but fewer than they would be afforded in civilian court. The effort, led by White House counsel Robert Bauer and White House Chief of Staff Rahm Emanuel, further sidelines Attorney General Eric Holder, who at a hearing Tuesday continued to argue that the planners of the Sept. 11, 2001, attacks and other terrorists should be given civilian federal trials. 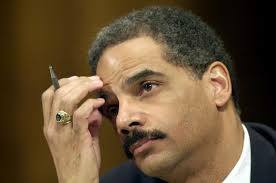 Any such deal would represent the final repudiation of Mr. Holder’s November decision to bring the 9/11 plotters to civilian trial in New York City, and a switch for the White House, which suspended the Bush-era military commissions as one of its first acts in office. The White House and the Justice Department appear to be at loggerheads on the matter, and Justice Department officials say they are not a party to the negotiations. 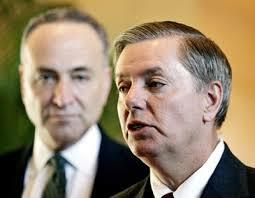 The framework of the deal is being led in Congress by Republican Sen. Lindsey Graham of South Carolina. Mr. Graham wants civilian courts to be reserved for low-level Al Qaeda operatives and terrorist financiers, a far smaller group than previously considered. The White House is quietly (until now) dividing the GOP on closing down Gitmo….. It appears that the White House is holding negotiations with Se. Linsey Graham of South Carolina…about what to do with the Guantanamo Bay faclitiy….and possibly opening a Federal Prison in Illinois…..and some other Republicans have been shut out and don’t like it……. Talks between Sen. Lindsey Graham (R-S.C.) and the White House on closing the Guantanamo Bay military prison in Cuba are angering House Republicans who oppose any transfer of detainees to U.S. soil. Graham, who supports closing the prison as long as doing so does not compromise national security, earlier this week acknowledged that he has held a series of meetings and had phone calls with White House Chief of Staff Rahm Emanuel over the last several weeks over the issue. Graham wants to establish a new national security court where most of the remaining Guantanamo Bay detainees could be tried. In the talks with Emanuel, he also has expressed a willingness to extend some habeas corpus rights to prisoners detained on terrorism charges. He’s also discussed the need to rewrite a “rule of law” statute that would ensure some logical process for detaining terrorism suspects that would also provide oversight and judicial recourse. The Graham-Emanuel talks have unnerved Rep. Pete Hoekstra (Mich.), the senior Republican on the House intelligence committee. “I think it’s crazy to be negotiating with the White House on this,” said Hoekstra, a vocal critic of transferring detainees to U.S. soil. He and other House Republicans are worried that Graham will agree to throw his political support behind Obama’s plans to move detainees to a prison facility in Thomson, Ill., in return for forging a deal with the White House on a new national security court system. Rep. Don Manzullo (R), who represents the district where the Thomson facility is located, was equally adamant. “If Lindsey Graham is involved in talks about moving detainees to Illinois, I hope he would talk to me first,” he said. As the chief architect of 2006 and 2009 legislation creating military commissions, Graham’s views could carry significant political weight.